We had a great couple of days at the Sunbury Community Library working with the summer program in a rocketry class. We built Semroc My Boid and Quest Payloader One kits, and discussed rocket science, safety, and construction techniques. It’s always encouraging to see the enthusiasm and curiosity of today’s youth! Our launch on 7/14 had to be postponed due to wet conditions, but was fine for the rain date on 7/21. We had a great day, the kids and their families had a great time. One rocket that didn’t go together well failed our swing test, but that was a great learning experience. The other rockets all flew well, and recovered well. We put a Quest How High altimeter into a payload section and flew it on a few of the Payloader Ones, with a variety of motors. We had the crowd guess what altitude would be achieved with each flight, and there were some pretty good guesses. 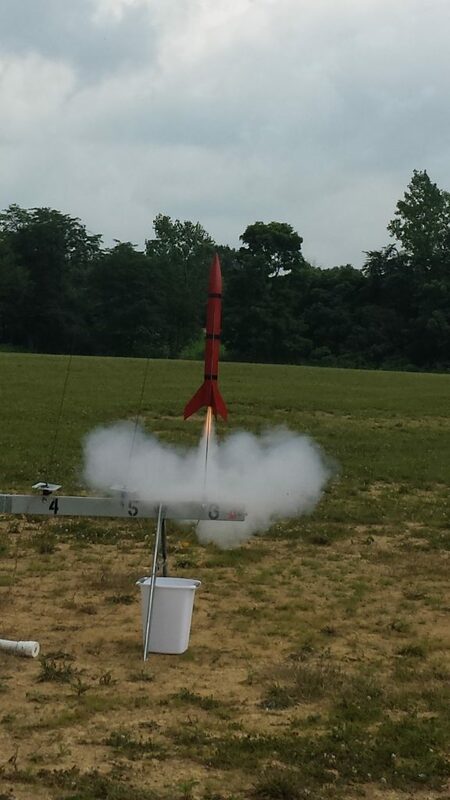 On an A6-4, it got to 131 ft; on a B6-4, to 359 ft; and on a C6-5, it flew to 675 ft.
Club members flew some of our own rockets too. Below is a great photo of Curtis’s Maxi Alpha III lifting off. Thanks to all of the members who helped with the class!